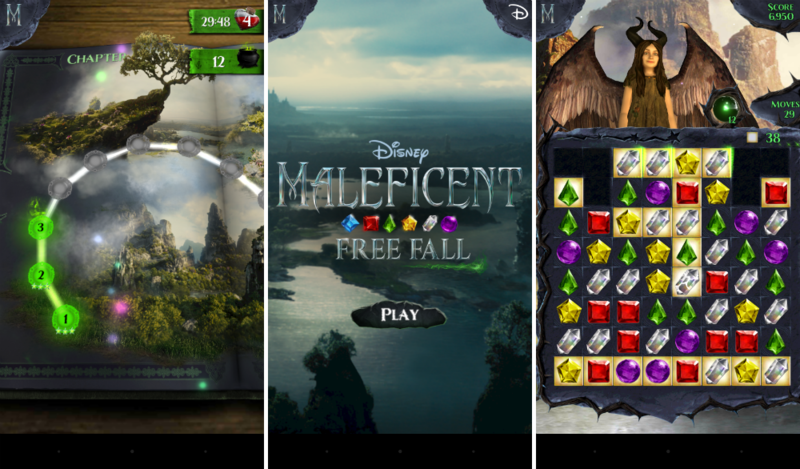 An upcoming movie titled Maleficent is set to hit theaters on May 30, but as with most Hollywood blockbusters, a game to go along with the film is now available on both iOS and Android. The game, Maleficent Free Fall, reminds me of a mix between Candy Crush and Bejeweled, but it is easy to see that the developers behind the game have spent quite a bit of time on this creation. Upon opening, you will notice that if you twist your device around, you will see a parallax effect, much like you see on iOS 7 devices. This same effect is also used in each level of the game, being quite the premium touch for such a simple title. As mentioned, it plays much like Bejeweled, where players match 3 or more shapes to collect points and boost power ups for obtaining high scores. As far as a storyline goes, we get to watch Maleficent grow up from a little evil villain in the early levels, to a grownup villain in later levels. To tie in Candy Crush, players only have a certain amount of lives to use, and if you fail a level, you lose a life. Lives are regained by waiting out a timer, just like in Candy Crush. The game is free to download and play, but parents beware, there are plenty of IAPs for your children to get in trouble with.